July 2004 saw the return of the 2003 Harvey and Eisner nominated anthology for yet another offering of comics from various parts of the globe. 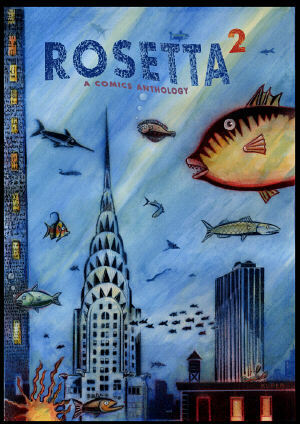 Rosetta Volume 1 was picked as one of the ten best comics of 2003 by TIME.com, and Volume 2 is even better. It includes new and previously untranslated works by Edmond Baudoin, Martin tom Dieck, Miriam Katin, Lat, Max, Jason Lutes, Paul Pope, R. Sikoryak, Ted Stearn, Craig Thompson and others. Also in this volume, an overview of Chinese cartoonists Feng Zikai and Liao BinXiong, who represented the leading edge of cartooning in China during the early 20th century. Underneath covers provided by Peter Kuper and Megan Kelso, Michael Kupperman provides an extended remembrance of the Thirties, Jason Lutes delves deep into experimentation and existentialism; R. Sikoryak finds his life transformed into a comics strip, the Spanish cartoonist, Max, takes a break from his comics sabbatical to present a new direction in his comics art; Craig Thompson discusses the genesis of humanity; Paul Pope contributes a “poem-story” as well as hitherto unseen pages from his manga project at Kodansha; and Miriam Katin charts the life and death of Caspar David Friedrich through a series of paintings. The second volume also presents, for the first time in English, Martin tom Dieck’s seminal story, “Fragments Fugitif” as well as a 26-page short story by Edmond Baudoin.